These short tours are available from Dubai International airport for any one travelling for a short time in Dubai or transiting at Dubai airport or simply like to see Dubai taking short time off from the business trip to Dubai. Following tours are available for any group size and can be taken on any day of the week. 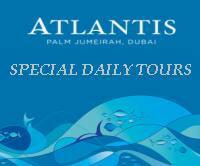 Day 01 We will meet you on arrival at Dubai International airport. After customs and immigration we will transfer you to your hotel. After check inn at hotel we will pick you up again and drive you to at the magnificent Jumeirah mosque and continue along the Jumeirah beach road, which is the most luxurious urban area in Dubai. We pass in front of the Mercato themed shopping mall and stop for photographs at the Burj Al Arab (Arab Tower) hotel. We continue towards the Nad Al Sheeba camel and horse race tracks, where we can witness camels training. We then head along the skyscraper area of Sheikh Zayed Road, also referred to as little Manhattan, where we pass by the Emirates Towers and Dubai World Trade Center. Then we drive along the Zabeel road, passing by the palace of Sheikh Mohammed, as well as the Sheikh Rashid palace, (No photography). We now head towards the Dubai creek, where we will stop for photographs of the creek side. We pass by the Al Bastakiya?s old-wind tower houses, which were built by the wealthy merchants of the past. Our next stop takes us to the historical Al Fahidi Fort, which has been converted into the Dubai Museum. The Museum is the 200 year-old restored Palace of Sheikh Saeed, which has important records of pearl diving and trading activities that went on. We will bring you back to hotel for a fresh up. Later we will drive you into the Dubai desert where you will have a desert dune safari you will have a superb dinner and dance in the desert late evening 9:30PM return to hotel overnight at hotel. Day 02 Morning free at leisure afternoon transfer to airport for flight to onward destination. Above cost Includes tours as described in the Itinerary above all entrance fees taxes and English speaking Guide with the tour. Dubai 3 Days Shopping our. Day 02 Morning free at leisure afternoon Embark on a shopping tour of Dubai overnight at hotel. Day 03 Morning free at leisure afternoon transfer to airport for flight to onward destination. Cost US$ 442 Per person With hotel on double occupancy tours and breakfast. US$170.00 Single supplement Contact us to book this tour. Above cost Includes tour as described in the Itinerary above all entrance fees taxes 4 star hotel accommodation on double occupancy bed & breakfast basis and English speaking Guide with the tour. Day 01 Meet upon arrival at Dubai International airport. After customs and immigration we will transfer you to your hotel. Later we will drive you into the Dubai desert where you will have a desert dune safari you will have a superb dinner and dance in the desert late evening 9:30PM return to hotel overnight at hotel. Day 03 free at leisure afternoon transfer to airport for flight to onward destination. US$ 570.00 Per person double occupancy in 3 star hotel US$ 85.00 Single supplement Contact us to book this tour pay on your arrival. US$ 570.00 Per person double occupancy in Sofitel city center (5star hotel) US$ 85.00 Single supplement Contact us to book this tour pay on your arrival. Day 03 free at leisure overnight at hotel.